The National Library Service (NLS) has just released BARD Express for patrons of talking book libraries around the country. 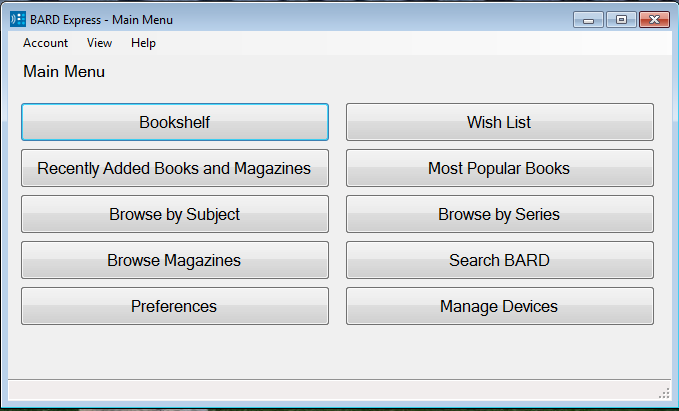 BARD Express is a free, Windows-based application designed to simplify searching for, downloading and transferring audio books and magazines from the BARD website to an external USB drive for use with the digital talking book players. BARD Express is available to any talking book patron who has an active BARD account with the library. Talking Books patrons can apply for a BARD account online here; if patrons are unsure of their log in information for a current BARD account they can contact the library at tbbl@library.in.gov or 1-800-622-4970. BARD Express will be available to download from the BARD main page under the “Additional Links” heading. It will only work on Windows based PCs and will work with a variety of screen readers, including Window eyes, NVDA and Jaws. For more information on BARD express, please vision the BARD Express Homepage page or watch the YouTube series “BARD Express How-To Series” from the Library of Congress. This blog post was written by Maggie Ansty. For more information, contact the Indiana Talking Book and Braille Library at 1-800-622-4970 or email tbbl@library.in.gov.